A young George Washington chopping down a cherry tree isn’t the only presidential myth out there. 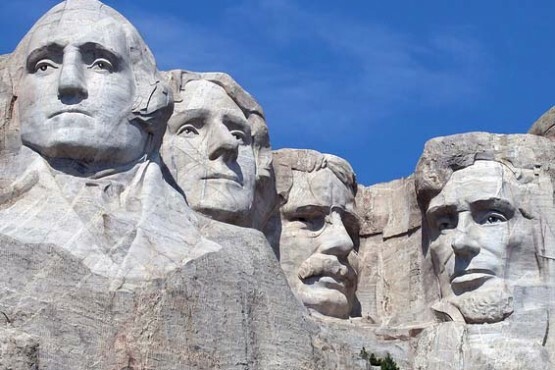 Take the quiz to see if you can tell fact from fiction when it comes to the lives of U.S. presidents. Ready for some Presidential Trivia? William Howard Taft was so big (he weighed over 300 pounds), he had to install an oversized bathtub in the White House. Taft did have an oversized bathtub installed in the White House when he became president, but it is debatable whether or not he actually got stuck in the White House’s original bathtub. The teddy bear is named after Theodore “Teddy” Roosevelt. George Washington had several sets of dentures, but none were made from wood. His dentures were made from gold, ivory, lead, and actual teeth! Zachary Taylor became ill after eating cherries and milk at a Fourth of July celebration in Washington, D.C. — he died a few days later on July 9. Some believed his cherries were poisoned, but after his body was exhumed and tested for arsenic, this hypothesis was ruled out. It is believed that he contracted cholera, typhoid or some other kind of food-borne bacteria. Gerald Ford was a fashion model before he became president. Gerald Ford appeared in Cosmopolitan and Look magazines in the early 1940s. Harry S. Truman’s middle name is the letter S.
When he was born, Truman’s parents wanted to honor both his maternal and paternal grandfathers, each of whom had a name beginning with the letter S. In lieu of choosing one name over the other, his parents just left his middle name as S.
Lincoln never wore a stovepipe hat. Lincoln did wear a stovepipe hat, but more interestingly, he used it as a storage place for letters, bills, and notes. The Curse of Tippecanoe (or Tecumseh’s Curse) is a myth. Whether or not an Indian chief actually placed a curse on the White House is unproven, but beginning with William Henry Harrison, every president elected in a year ending with zero has died in office. The curse was broken by Ronald Reagan, who narrowly escaped death after being shot by an assassin in 1981. Franklin Delano Roosevelt was distantly related to Theodore Roosevelt. Franklin Delano Roosevelt and Theodore Roosevelt were fifth cousins. This was a great test! We never knew that these were going to be the questions! The quiz was hard but fun for our class! I tried….. Wasn’t as easy as I thought! I learned some new things, though. This test was to hard. SCREW THIS! EVERYTHING I WAS TAUGHT IN SCHOOL IS WRONG! I did not know that Gerald Ford was a model! ERMAHGERSH TERST WERS SRRRR HERD!!!!!!!!!!!!!!!!!!!!!!!!!!!!!!!!!! Those are quite some interesting facts! I had no idea that the word “teddy” in teddy bear had anything to do with Theodore Roosevelt. How interesting. Cool test! I always believed that George Washington had wooden teeth but I guess not!